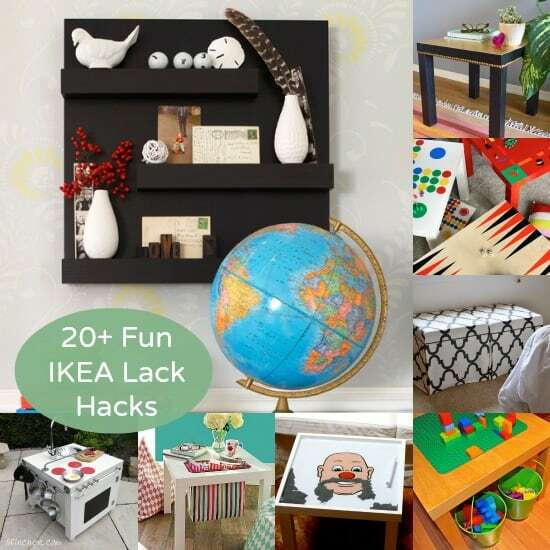 Home / DIY Home Decor / Furniture / IKEA Lack Table Hack – Get 20 Ideas! 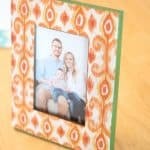 The Lack side table is under $10 at IKEA; If you want to try an IKEA Lack table hack of your own, you’ll love this collection of projects! 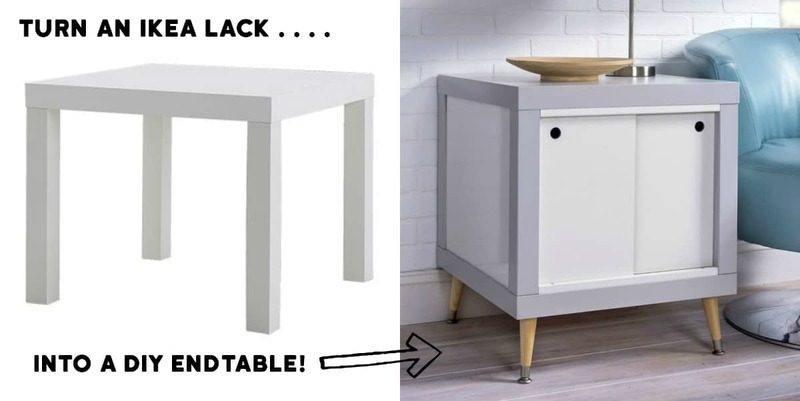 If you are into IKEA hacks, there’s almost no better item to try than IKEA’s Lack table. At under $10 for an entire table, there’s almost no risk in purchasing one or more and trying a side table hack of your very own. The Lack side table comes in five colors (sometimes they add a fun color just because) which gives you a lot of possibilities for projects to try. Just because the Lack is cheap doesn’t mean you want it to look that way, right? That’s where some well planned IKEA hacks come into play – and there are tons of ways to hack the Lack side table and turn it into the home decor piece you really want. Some of these IKEA Lack hacks look a bit more upscale and others are just really fun. If you take a peek at the list of IKEA end tables they have online, you can see immediately why hacking the Lack is so popular. It’s not just the fact that it’s cheap, but it’s also because the table essentially forms a large box. The top is completely square at 21 5/8″ x 21 5/8″, while the legs are 17 3/4″ long. The fact that a Lack is (almost) square makes it really easy to stack, and very straightforward when it comes to cutting, gluing, or screwing. I can see why an IKEA Lack hack is one of the first IKEA hacks that people try. It’s great for beginners – no expertise required except for a basic knowledge of tools! This post shows what your Lack side table looks like inside. Basically the top has a special honeycomb type construction that means it’s not solid wood but it can still hold weight. The legs are hollow except for small pieces of particle board at the top and bottom. Now you know why the table is so lightweight! Because the Lack isn’t solid, you’re going to want to use a finishing blade on a regular miter saw to cut the the legs. I recommend figuring out where you want your cut, marking it, and then placing a piece of painter’s tape all the way around the leg. You’ll cover the mark but you’ll still be able to see it if you used a black marker. Cutting the leg at the tape mark gives you a clean cut and keeps any splintering from happening. When you cut the top, I recommend drawing your shape first – let’s use a rectangle as an example. Draw the rectangle and then drill into the four corners (doesn’t matter what size). Don’t drill down through the bottom. 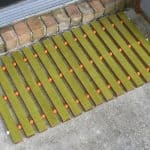 Use a jig saw to connect one drilled hole to another. Again – don’t go through the bottom; only the top layer. Use a pair of scissors or a utility knife to cut out that portion of honeycomb. Then repeat the process above on the underside, measuring so that it exactly matches the rectangle you made on the top (obviously a measuring tape will be required). Sand the cut edges to finish. Are you ready to hack a cheap-yet-attractive IKEA side table into the DIY of your dreams? I’m excited for you to see what I pulled together; just scroll down and let me know which IKEA Lack table hack is your favorite! I love the pleather that Chelsea added to the top of this IKEA side table – and the upholstery nail trim makes it look even more sophisticated. In this IKEA Lack table hack, you’re going to create an end table with sliding doors. It’s easier than it looks! Who knew that a couple of IKEA end tables could be turned into expensive looking ottomans? This idea is genius. 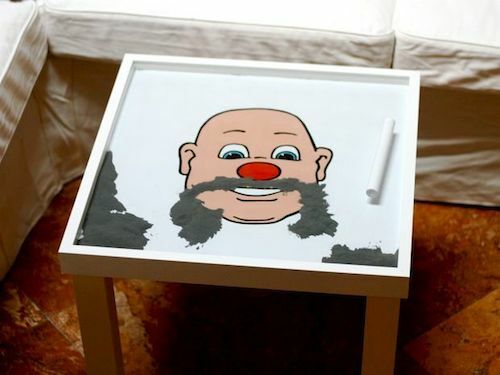 This could be my favorite IKEA Lack hack of all time – turn one into a huge Wooly Willy game, complete with iron fillings for the hair. Take this genius idea and turn your Lack into a mini play kitchen. It’s a two part blog and it’s in German, but it’s worth seeing (and you can translate it). This IKEA side table got a major improvement with decorative wood legs and trim. I especially love the turquoise touches! Finally, there’s something to do with your bottlecap collection! I love this revamped Lack top, made with grout. Grab four IKEA end tables for an interesting display bookshelf for your living room. This tutorial turns an entire Lack side table into a shelf – using the legs for the displays. This IKEA Lack hack is so useful! You can just store magazines or other goodies in the fabric storage pouch cut down into the center. Monica used bamboo veneer to create these large silhouettes – making a bold statement on her two IKEA end tables. This is a puppy bed made for a king (or queen)! You can use the Lack table as your frame and create any shape headboard you like. Keep Legos off of the floor (and from permanently mangling your feet) by making a table that doubles as a play center and storage. This double-deck Lack kitchen island is brilliant, especially if you have a small kitchen. 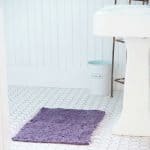 Give the Lack a completely different look by adding placemats and rope to cover. You can get corbels at the home improvement store, and they completely changes the look of the IKEA Lack. You’ll just need strong glue to keep them in place (like Titebond) and then you’ll want to paint the entire table to match. “Real” chalkboard tables are expensive – you’ll just need a Lack and chalkboard paint to make one. No painting required – you can turn Lack tables into game boards using vinyl. Overlays are a great way to give a new look to a piece of furniture, and they work with the Lack really well. This simple hack turns the tables into cubes, but I love how they look as a coffee table when you put two together. 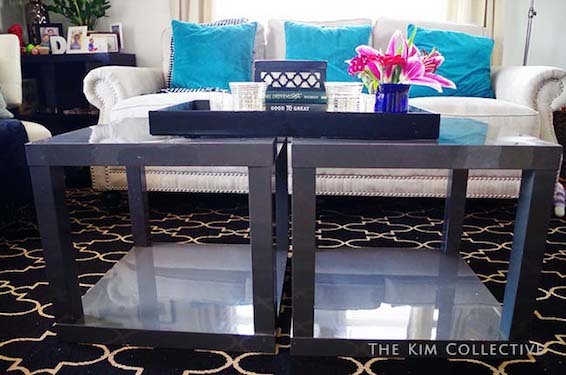 Use two Lack tables to create a coffee table with inside storage. This stenciled and chalk painted tabletop makes the Lack look like a million bucks. I love maps on everything, and that includes this map and decoupage table revamp in this Lack hack. Add a light to the inside of an IKEA side table to turn it into a fun toy that the kids will love. My dogs push their bowls around the kitchen floor when they eat – it would be nice to have them stay in one place. 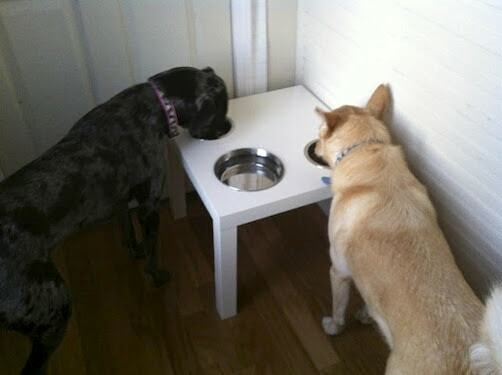 This IKEA Lack table hack went straight to the dogs! Want more IKEA hacks? Visit our collection of 8 IKEA coffee table hacks to see some great projects! Hi ! I’d like to ask you if it is possible to change the url of the ikea hack picture sending to my article about customizing an ikea lack table. Done and thank you Sophie!